BATTLEFORWORLD – April 13, 2018 (updated): Russian news services are reporting that the Pentagon and President Trump gave the military the go ahead in concert with Britain and France to launch an attack against Syria. The strike aggression was against what the Pentagon briefing called selected targets that manufacture chemicals. This is rather strange, because if the Pentagon knew of facilities why not tell the OPCW and have them visit the sites to determine if they are such? But rather the Pentagon claimed that they gave the go ahead to strike facilities. The sites that were targeted did they release their chemicals into the air in the explosions? Also rather strange is that the Pentagon says that the strikes in Syria were a ‘one time shot’ to send a strong message to Assad. But it could be that the US, UK and France war jets and missiles were met with Russian high technology and had to call the bombing mission off in Syria quickly – the attack on the sovereign country of Syria lasted for 15 minutes. So that means the neocons’ aggression firepower militaries from the US, UK and France were overwhelmed with the awesomeness of Russian special things. SPUTNIK NEWS – May 31, 2018: Russia’s Radio-Electronic Technologies Concern (KRET) has confirmed that its engineers are using unexploded Tomahawk cruise missiles from April’s failed US airstrikes on Syria to help develop new electronic warfare systems. Sputnik looks back at some of the other weapons Russia captured and reverse engineered from US overseas wars over the years. Having this missile in hand, we can clearly understand what channels of communication, information and control, navigation and range finding it has…Knowing these parameters, we will be able to more effectively counter these cruise missiles at all stages of their combat deployment,” Mikheev said. And that “The electronics of the current version of the Tomahawk [include] the latest-generation TERCOM [navigation] system, as well as a system of target search and detection. An analysis of these systems will complement the picture, and help expand the capabilities of our early warning systems when detecting missiles of this type,” he said. SPUTNIKNEWS – April 16, 2018: An American journalist who gained access to the war-torn town of Douma, where the US, France and the UK charged that Syrian President Bashar al-Assad used chemical weapons against civilians, says he found “no evidence” of a chemical weapons attack. ONEAMERICANEWSNETWORK – April 18, 2018: The people of Syria are speaking out against media reports that suggest Assad has planted informants to deny the alleged chemical attack in Douma. BATTLEFORWORLD – April 16, 2018: It is now clear what is going on. The shadow ones in Israel with their allies are behind the warfare in Syria… The fabricated chemical attack by the militants backed by the West on April 7 and thereafter the event gained traction in western media to go to war. The Israeli military then launched a missile strike at the Syrian T-4 air base in Homs from Lebanese territory on April 9. 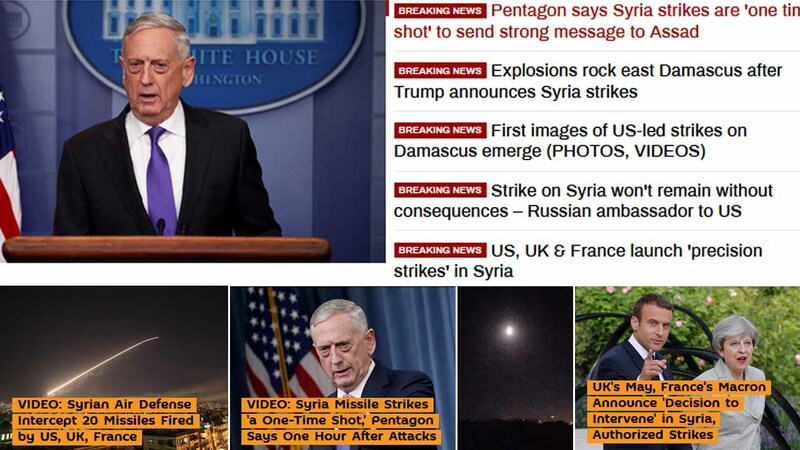 The staged chemical attack in Syria gained massive news traction in the West and brought together the UK, the US and France into taking unilateral action. The Israeli military had already opened the gateway launching the first strike and it was now the UK, the US and France’s turn. Russia informed the misled troika that if their military positions inside Syria was attack, they would retaliate. And on April 14 with precautions taken the militaries from the UK, the US and France all launched an attack inside Syria with the Syrian military shooting down 71 missiles (and 29 missiles were mysteriously lost) and a few of the missiles hit desperate targets that had nothing to do with the chemical attack staged by the militants supported by the West. It became apparent that the attack mission by the UK, the US and France had failed, but the media fanfare continued, saying that the mission was successful with President Trump threatening that the US military might strike again. Obviously, Israel was not happy with the results of the attack mission and knew that if it was to be repeated it would not be quick enough for Trump to announce another attack because of obstruction from parliamentary questioning of Theresa May and Emmanuel Macron about their unapproved military action, and the OPCW fact finding mission in Syria is gathering information regarding the chemical attack that took place there, etc., and the western backed militants would have to stage another false-flag with the media again stirring up momentum to manipulate the public and that would take time before another strike happens. And Israel knows that their military is the only one that can carry out additional strikes and get away with it always. And true to form, on April 17, the Israelis and the US did “a joint electronic attack” to get targeting information about the Syrian radar system. And so the shadow ones in Israel and abroad have become desperate. RT – April April 16, 2018: Israel will not accept any limitations to its operations in Syrian airspace against ‘Iranian threat’, the defense minister said, expressing hope that “communication” lines with Moscow will help avoid any “friction” in the air. On Tuesday morning, a series of missile strikes once again targeted Syrian military infrastructure. The Pentagon, which led the coordinated April 14 assault against Syrian targets with its British and French allies, denied its involvement in attacking a new set of targets. Israel, which struck Syria’s Tiyas (T-4) airfield in Homs province on April 9, also failed to acknowledge bombing its neighbor. Yet the new attack against Syria comes just hours after Israeli Defense Minister Avigdor Lieberman vowed to protect the country’s national interests through breaching Syrian airspace if necessary. SPUTNIKNEWS – April 16, 2018: Russian experts who conducted the verification of reports on the use of chemical weapons in the Syrian city of Douma, found participants of the video’s filming, which was presented as evidence of the supposedly occurring chemotherapy, according to the Russian Envoy to the OPCW. SPUTNIKNEWS – April 16, 2018: The Russian Envoy to OPCW said that chemical weapons provocation in Syria was carried out by non-governmental organizations (NGO) that the UK and the US paid for cooperation. Everything has been developing according to the script that was prepared in Washington. There is no doubt that Americans are playing the ‘first violin’ in all of this. The United States, the United Kingdom, France and some other countries after the “fake” addition from the White Helmets and their ilk in Douma, immediately pounced upon the Syrian authorities with accusations,” Alexander Shulgin said. “Among them, are the notorious ‘White Helmets,’ which some delegations are so fond of praising,” Shulgin noted. “Everything has been developing according to the script that was prepared in Washington. There is no doubt that Americans are playing the ‘first violin’ in all of this. The United States, the United Kingdom, France and some other countries after the “fake” addition from the White Helmets and their ilk in Douma, immediately pounced upon the Syrian authorities with accusations,” Alexander Shulgin said. SPUTNIKNEWS – April 16, 2018: Russian Foreign Minister Sergei Lavrov said Monday that all proofs of the alleged chemical attack in Douma, provided by some Western leaders, were taken from media and social networks. “I can’t be impolite in regard to the heads of other countries, but you’re citing leaders of the US, the UK and France. Speaking frankly, all proofs that they’re referring to, based on media and social networks,” Lavrov said. Russia did not try to change the site of a suspected chemical attack in the Syrian city of Duma, Russian Foreign Minister Sergey Lavrov said Monday. “I can guarantee that Russia has not tampered with the site,” he told the BBC. Lavrov’s statement comes amid claims by US ambassador to the OPCW Kenneth Ward, who said that Russia may have visited the site of the attack and tampered with it. According to the head of the Russian foreign policy, the latest attack by the US, the UK and France won’t be left unanswered. There would be consequences. We lose basically the last remnants of trust to our Western friends… They punish first in Duma, in Syria, and then they wait for the inspectors of the OPCW [Organisation for the Prohibition of Chemical Weapons] to visit the place to inspect. Proof by punishment is what is being applied by the troika of Western countries,” Lavrov told the BBC broadcaster. CNBC – April 15, 2018: US claims on setting back Syria chemical weapons capability likely exaggerated, say experts. And some defense experts poured cold water over Pentagon claims Saturday that the U.S.-led strike set back Syria’s chemical weapons program “for years”. One of the three targets in the airstrikes was a chemical and biological weapons research and production facility just outside Damascus. YAHOO – April 15, 2018: Russian President Vladimir Putin warned on Sunday that further Western attacks on Syria would bring chaos to world affairs, as Washington prepared to increase pressure on Russia with new economic sanctions.In a telephone conversation with his Iranian counterpart Hassan Rouhani, Putin and Rouhani agreed that the Western strikes had damaged the chances of achieving a political resolution in the seven-year Syria conflict, according to a Kremlin statement. Vladimir Putin, in particular, stressed that if such actions committed in violation of the U.N. Charter continue, then it will inevitably lead to chaos in international relations,” the Kremlin statement said. LaRouche Says Cancel the Britain Empire! LAROUCHEPAC – April 16, 2018: A week of British generated war propaganda replete with fake and incendiary images created to dupe the very stupid into believing somehow that Putin eats human flesh and Assad spends all his time torturing infants and puppies. What is most rotten about this strike is that the President joined his own worst enemies, the British and French imperialists, in a step toward war with Russia and China. Donald Trump won the election because the people revolted against a system, the Anglo-Dutch imperial political system, which Lyndon LaRouche cites as the real enemy which has taken over and ruined our country. If the people who supported an end to imperial wars, a rebirth of American creativity, manufacturing, and scientific progress, an end to the Wall Street casino economy, don’t come out and fight now, if you are depending on one man to accomplish all of this without yourself engaging and organizing to create a real future, yes, all could be lost. A movement is being born now to fulfill what was only mooted in the 2016 election. Our first goal is to secure a Congress of thinking human beings in the Congressional elections of 2018 while we continue to fight to expose and eliminate the Anglo-American swamp surrounding the President. RT – April 15, 2018: Bashar Assad praised the quality of Soviet-made air-defense systems after the US, UK, and France bombarded Syria on Saturday, Russian MPs said after a meeting with the Syrian president in Damascus. “Yesterday we were faced with an American aggression. And we were able to repel it with Soviet missiles from the 1970s. Since the 1990s, the American films presented the Russian weapons as lagging. And now we see who really lags behind,” Assad was cited as saying by MP Dmitry Sablin. Earlier, the Russian Defense Ministry said that Soviet-made S-125, S-200, Buk, Kvadrat and Osa systems, used by the Syrian military, intercepted 71 out of the 103 missiles fired by the US and its allies. SPUTNIKNEWS – April 14, 2018 (updated): The Russian Defense Ministry stated that most missiles launched by the Western states on Syria had been downed by the Arab Republic’s air defenses, when approaching targets. A total of 100 cruise and air-to-surface missiles were launched at targets in Syria, the Russian Defense Ministry stated. Later in the day, the Russian General Staff issued a statement, saying that a total of 71 cruise missiles out of 103 had been intercepted by Syria, adding that no government military airfield had been damaged as a result of the attack. And that Syrian air defense forces have intercepted all 12 cruise missiles, which had been used to attack the Dumeir military airfield, according to the Russian Defense Ministry. SPUTNIKNEWS – April 15, 2018: The US-led missile strike against Syria, allegedly aimed at suspected chemical weapon sites, has reportedly resulted in the destruction of a pharmaceutical facility used to produce cancer drugs. Since the Syria crisis broke out, the country has been short of all kinds of medicines due to the sanctions from Western countries. Foreign companies stopped exporting high-quality medicines to Syria, especially anti-cancer medicines. So we have been conducting researches on anti-cancer medicines here, and three cancer drugs have been developed,” the facility head said. SPUTNIKNEWS – April 14, 2018: The Syrian authorities have not made any official statements on the total scale of the damages or casualties as a result of West’s strikes yet. At least 6 civilians have been injured as a result of a missile strike on a military depot to the west of Homs, a local security source told Sputnik. Also, SANA agency reported that at least three civilians were injured as a result of the western states’ strike on a Syrian military facility in Homs. According to Syria’s Ministry of Information, Western media are exaggerating the scale of US, UK and French strikes against the targets in Syria. “The Ministry of Information calls on citizens not to trust any media reports, which are deliberately or undeliberately exaggerating the number of targets and consequences of the trilateral aggression,” the ministry said, as quoted by the Syrian State Television. “There’s an obligation, particularly when dealing with the matters of peace and security, to act consistently with the Charter of the United Nationals and with international law in general,” Guterres said in a statement over the coordinated series of airstrikes by the US, the UK and France in Syria. Guterres called on all the UN members to “unite” to deter further escalation that might aggravate the suffering that the Syrian people have endured during the conflict. “I urge all Member States to show restraint in these dangerous circumstances and to avoid any acts that could escalate the situation,” he said. SPUTNIKNEWS – April 13, 2018: New video reportedly taken from Syria shows air-defense interceptors taking flight after US President Donald Trump announced that the US, UK and France would strike Syria. ​”God bless you, God bless you,” a man can be heard saying, shortly after the interceptor seemed to collide with a missile, making a large boom sound. “F*ck those American bastards,” the man from the video says. The Syrian Army reports shooting down 20 US, UK and French missiles. When asked about the missiles, the Pentagon during a briefing that it could not comment on the reports. On Friday night, Trump said that strike operations were underway in response to an alleged attack in Douma, which Damascus and Moscow maintain was a false flag. Analysts are puzzled by the logic of Trump’s decision to stand up against “Gas Animal Assad” by raining explosives on Syria and killing Syrians. Damascus, Homs, a research facility in Barzeh, and an IRGC base in Qasioun Mountain have reportedly been targeted during the military operations. RT – April 13, 2018: The Russian Ambassador to the US has warned of “consequences” after the US and its allies launched a coordinated military action against Syria. RT – April 15, 2018: The US, Britain and France trampled international law to launch missiles against Syria, claiming to have “evidence” of the government’s use of chemical weapons. That evidence is based on terrorist lies. BATTLEFORWORLD – March 20, 2018: As President Trump went into the White House the Deep-State neoconservatives had warfare in the planning for him to attack Syria. And Trump’s naivete to the world’s geopolitics believe that he was on a mission of good when he gave the orders to launch missiles at Syria based on fraudulent reasons given to him. And according to an article by SputnikNews, Russia’s Rossiyskaya Gazeta daily cited military experts as saying that the Rychag-AV jammers added significantly to reducing the effectiveness of the US air strike on Syria’s Ash Shairat airbase in April 2017. And now we know that in the background, hidden hands were responsible for the US missiles launched at Syria to go blind and miss their targets. RT – March 20, 2018 (posted April 7, 2017): The Russian Defense Ministry says the US missile strike on a Syrian airfield wasn’t very effective, with only 23 out of 59 Tomahawk missiles reaching their target. The locations of the remaining 36 missiles’ impact is now unknown, the ministry added.